Allergy Advice: Contains Fish (Mackerel), Soybean, Wheat. 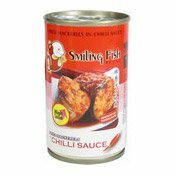 Ingredients: Fried Mackerel (Mackerel (57%), Palm Oil (3%)), Water, Sugar, Palm Oil, Chilli (5%), Soy Sauce (Soybean, Salt, Water, Wheat, Sugar) (2%), Salt, Distilled Vinegar. Simply enter your details below and we will send you an e-mail when “Fried Mackerels In Chilli Sauce (辣醬炸馬鮫魚)” is back in stock!